Gaana app is a free Windows 8 music app that lets you listen to top Bollywood songs by streaming music in just a couple of clicks. 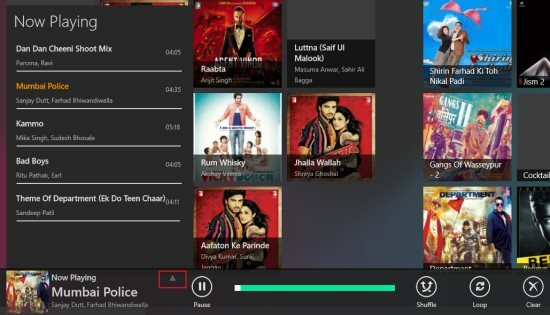 This music app for Windows 8 comes up with a complete library of millions of Bollywood songs ranging from the hit oldest numbers to latest rock Bollywood songs to popular folk songs, regional songs, chart topper, just from all the genres. As you open the Windows 8 Gaana app, you will see the current popular tracks at the left side of the screen in a different category. While the featured albums will be shown at the right side in a different category. As you click on one of the popular tracks given, you will soon find the track played at the bottom of the screen. However, if you select an album from the right side, you will be displayed with all the tracks of that selected album. In addition, the Windows 8 music app also brings you other related albums to check out. Now, as you dig deep inside the other related albums, it will keep on displaying more related albums. However, one things I did not like while digging more inside is that there is no way to go back to the home screen directly. You have to click on the back arrow button to go to the previous album and then finally to the home page. Check out more Windows 8 Apps reviewed by us.